For every serious coffee drinker with high tolerance of caffeine and who needs energy kick, we recommend some high caffeine K-cups. If you need something strong in morning in order to come to your senses, you probably don’t have the ability to measure with scoops and tamp coffee, you just want that cup of morning pleasure quick and with no fuss. That is the time when you turn to an easy solution like K-cups. Real coffee lovers enjoy in strong coffee because that is the only type of coffee that can shake them up. Here we give you some of the best k cups with most caffeine. This high caffeine K-cup coffee is a product of a haven for everyone who enjoys strong and bold coffee. When enjoying in strong coffee that comes from K-cups you definitely need to decide what is the amount of water you want to mix with one K-cup. The more water you add it will taste less strong. Its coffee beans are selected from USDA Organic coffee farms, its roasting is a work of art, and you always get a bold and strong coffee without unnecessary bitterness. Don’t be confused with the shape of its K-cup capsules, they match most of Keurig K-cup coffee makers. Its capsules are recyclable. Every capsule is meant for single serve. They are packed in a way to preserve their freshness. You will enjoy its strong taste. When your energy level falls its high levels of caffeine (2x more caffeine than regular K-cups) will lift you up in the sky. With such a catchy name you can say what you can expect from this type of k-cup high caffeinated coffee. Its capsule contains 300-350 mg of caffeine per one capsule, so this one will shake you up after just one sip. It is compatible with every Keurig coffee maker that support K-cups except the Keurig VUE. Many would expect that this is a dark roast, but it is actually middle dark roast coffee, and it has a nice taste. If you are sensitive to caffeine, don’t drink this one, it will most certainly cause insomnia. The name of coffee is totally appropriate since it will be a kick in a face once you try it. These 100 percent natural coffee is roasted in a special way in order to treat you every time with great taste. What you see is what you get, and here, boy you are gonna get a SHOCK! With best coffee chosen from the higher altitudes in order to get a more mature taste and quality, this K-cups are gonna treat you with strong taste. It is roasted in a special way known only by great masters using hyper-efficient thermal transfer and the best roaster machines. 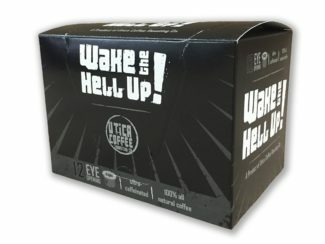 This coffee created for every Keurig coffee machine that supports K-cups has 50 % more caffeine than a normal cup of coffee, so this one is a nice shock that will lift you on your feet early in the morning. This is a mixture of Arabica and Robusta grown in mountains, it guarantees a great and strong taste without jitters. Bootleggers Extra-Caffeinated Dark Coffee is 100 % Arabica, and with that fact, we can claim that its taste is strong and without bitterness. 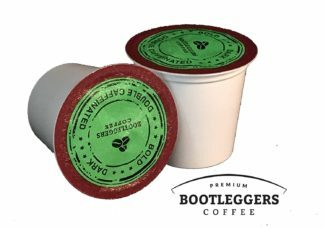 Bootleggers coffee is roasted in a special way to give you strong taste with a high level of caffeine in every K-cup capsule which is 175-200mg caffeine per cup. This coffee is more tasteful than others since it has a cinnamon flavor in it. You will enjoy that taste every morning. It is great to start a day with a strong but smooth cup of coffee. These are K-cup pods compatible with Keurig 2.0 coffee makers, every pod is meant for single serve, and they will be a real treat for every coffee lover who needs strong caffeinated coffee to survive a hard working day . 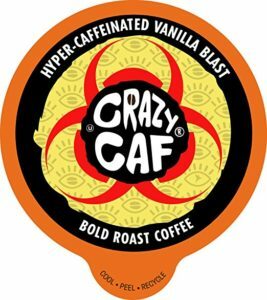 Crazy Caf Vanilla is one of the strongest high caffeine K-cup offered on this list. 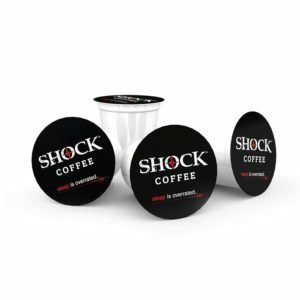 With 400 mg of caffeine in just one cup, it is four times stronger than a regular K-cups. Packed in a recyclable cup, it is created for everyone who enjoys strong coffee, with no gluten or lactose, this is perfect coffee for picky ones either. 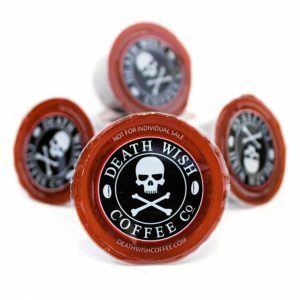 As the name says it is Vanilla flavored, and these capsules match every single Keurig K-cup coffee maker. Its flavor has no bitterness since it is made of 100 % Arabica coffee beans. 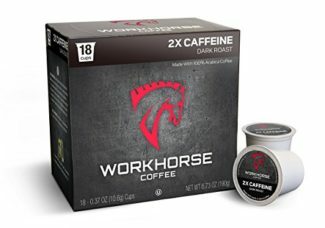 If you don’t like to drink sweet coffee and you don’t like bitterness either, this one is right for you. The vanilla scent gives it what is necessary to be a perfect cup of strong and flavored coffee. If you do not like vanilla flavor you can also choose Bold coffee with same amount of caffeine. Another 100 % Arabica coffee beans which are carefully chosen for you from many different regions of the world. This one is not strong as the previous one, it is just two times stronger than the regular cup of coffee, but if you are not a strong coffee freak this one will be enough to weak you up and lead you through a rough workday. This coffee is roasted in small batches in order to get extra strong and smoked flavor. These K-cup are suitable for all Keurig K-cup coffee brewers. If it is really hard for you to get up in the morning and lift yourself with a regular cup of coffee, then it is time to use some of these extra caffeinated K-cup heavy weapons. You will enjoy their strong and smooth taste we carefully chose for you.